Cloves are actually dried flower buds from clove trees. They are used as spices because they have strong pungent aroma. These unopened flower buds are usually used to taste Béchamel sauce, soups, ham sauces, and rice dishes. However, not many people are aware of the health and beauty benefits of cloves. In fact, it has been used for years in Ayurvedic medicine. Cloves are rich in anti-oxidants, fiber, omega 3 fatty acids, vitamins and minerals particularly manganese. 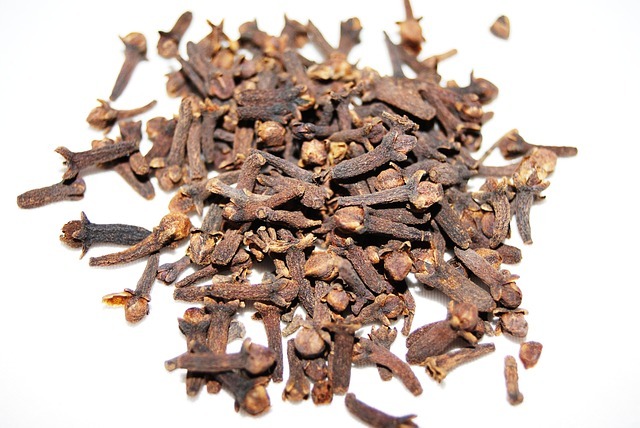 Cloves also have anti-fungal, anti-bacterial, analgesic and antiseptic properties which make it a popular household remedy for various diseases. Based on Ayuvervedic medicine, cloves are used to relieve a toothache temporarily. Due to its anti-bacterial and antiseptic properties, toothache due to bacterial infection can be relieved by applying a cotton ball soaked in clove oil to the affected area. It is also analgesic so it is best to swipe not only the affected tooth but also the surrounding gums as well. Clove oil is also good for sore muscles and spasms. It can be used as a massage oil to lessen the pain and reduce inflammation as well. Clove oil can also be mixed with other ingredients to form a poultice for bruises and scrapes. Upper respiratory infections such as cough and cold can be cured by drinking warm water with honey and clove oil. Some find clove tea as an effective expectorant too. Some people also drink clove tea regularly to prevent asthma. For those who regularly use clove as a seasoning, digestion is better aided. It can relieve flatulence, stomach aches, nausea, vomiting, diarrhea, and can even cure bad breath. For pregnant women who are experiencing morning sickness, an effective remedy is to make a solution made of tamarind, palm sugar and clove mixed in water. Just drink the solution twice a day until morning sickness is relieved. For those who are suffering from anxiety, stress and insomnia, drinking clove tea can help induce sleep and relaxation. Clove is also good for the skin. Due to its anti-inflammatory and anti-bacterial properties, clove is used to treat acne. Clove oil can be applied topically to treat acne and pimples. Just make sure to mix one part of clove essential oil to 10 parts of carrier oil. Pure essential oils can cause skin irritation if applied directly to the skin. Aside from being an effective anti-acne treatment, clove oil can also act as skin exfoliant. It can effectively remove blemishes and lessens the appearance of scars. When using clove as chemical peel, however, make sure to do with professional supervision to avoid any injuries or further damage to the skin. Aside from health and skin benefits, cloves are also good for the hair. For instance, clove oil can be used as hair grower and thickener. Some brunettes and those with auburn hair use clove oil mixed with olive oil as conditioner. To do this, just warm the mixture and let it cool. Massage into hair and scalp and cover with a shower cap.